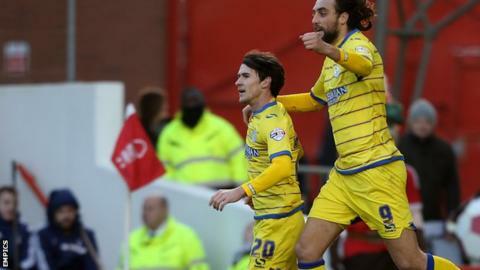 Kieran Lee's (l) celebrates his goal against Nottingham Forest, which was just his second of the season for Sheffield Wednesday. Sheffield Wednesday inflicted a fourth straight defeat on Nottingham Forest to increase the pressure on Reds manager Stuart Pearce. Kieran Lee bundled in the opener after Keiren Westwood had denied Forest's Robert Tesche with a reaction save. Lee forced the ball home after on-loan Chelsea defender Todd Kane blocked Atdhe Nuhiu's header on the line. Chris Maguire pounced to lash the Owls' second into the bottom corner to seal a third straight league win. Victory lifted Stuart Gray's side to within four points of the Championship play-off places. Defeat for Forest extended their winless run to eight matches and came after Pearce said he had the "skin of a rhino" as he tried to deflect reports that he could be sacked if results do not improve soon. A large portion of the home crowd showed their support for Pearce on three minutes, standing to applaud the former Reds captain, who played more than 500 games for the club as a left-back. The Owls fans gave a round of applause of their own on 17 minutes to pay respects to fellow supporter Josh Vaughan, who died after being hit by a train at Chapeltown railway station earlier in the week. Tesche produced the home side's only first-half effort on goal, testing Westwood following a scramble from a corner. While chances were rare at both ends, Wednesday made the most of their first real threat right at the end of the half. Stuart Gray: Wednesday manager on Forest win. Kane, starting on his Forest debut, denied Nuhiu's effort, only for Lee to throw himself at the rebound and squeeze in the opener. Forest keeper Dorus De Vries, making his first league start of the season ahead of Karl Darlow, could do little five minutes after the break as Maguire nipped into the box after latching onto a poor Jack Hobbs clearance and smashed home his fourth goal of the season. Michail Antonio went close to replying with a header soon after but Westwood was equal to the danger and Stuart Gray's Owls pressed for a third as Jaques Maghoma's shot deflected wide off Hobbs and Nuhiu volleyed narrowly off target. Lars Veldwijk, who came on to replace the injured Britt Assombalonga, had a late chance to pull one back for Forest, but could not turn in Ben Osborn's low cross, while Jamie Paterson was foiled by Westwood. "We are suffering a lack of confidence at the minute, but I told the players that we cannot feel sorry for ourselves. I certainly can't. "I am stood here thinking that we should have won 4-0 with the chances we created. The most important thing is that we did not want to give Forest a sniff. We wanted to turn their crowd against the team. Match ends, Nottingham Forest 0, Sheffield Wednesday 2. Second Half ends, Nottingham Forest 0, Sheffield Wednesday 2. Attempt blocked. Kieran Lee (Sheffield Wednesday) right footed shot from the centre of the box is blocked. Attempt blocked. Caolan Lavery (Sheffield Wednesday) right footed shot from the left side of the box is blocked. Assisted by Atdhe Nuhiu. Corner, Nottingham Forest. Conceded by Keiren Westwood. Attempt saved. Jamie Paterson (Nottingham Forest) right footed shot from the centre of the box is saved in the top right corner. Attempt blocked. Michail Antonio (Nottingham Forest) right footed shot from outside the box is blocked. Assisted by Robert Tesche. Attempt missed. Gary Gardner (Nottingham Forest) left footed shot from outside the box is high and wide to the right following a set piece situation. Gary Gardner (Nottingham Forest) wins a free kick on the left wing. David Vaughan (Nottingham Forest) is shown the yellow card. Attempt blocked. Jamie Paterson (Nottingham Forest) right footed shot from outside the box is blocked. Substitution, Sheffield Wednesday. Caolan Lavery replaces Chris Maguire. Attempt missed. Lars Veldwijk (Nottingham Forest) right footed shot from the right side of the six yard box is close, but misses to the right. Assisted by Ben Osborn with a cross. Substitution, Sheffield Wednesday. Lewis Baker replaces Jacques Maghoma. Offside, Nottingham Forest. Dorus de Vries tries a through ball, but Lars Veldwijk is caught offside. Offside, Nottingham Forest. Gary Gardner tries a through ball, but Lars Veldwijk is caught offside. Substitution, Sheffield Wednesday. Jeremy Helan replaces Stevie May. Substitution, Nottingham Forest. Jamie Paterson replaces Todd Kane. Substitution, Nottingham Forest. Lars Veldwijk replaces Britt Assombalonga because of an injury. Corner, Sheffield Wednesday. Conceded by Todd Kane. Attempt missed. Atdhe Nuhiu (Sheffield Wednesday) right footed shot from a difficult angle on the right is close, but misses to the left. Assisted by Claude Dielna with a cross. Corner, Sheffield Wednesday. Conceded by Eric Lichaj. Attempt missed. Atdhe Nuhiu (Sheffield Wednesday) header from the centre of the box misses to the left. Assisted by Chris Maguire with a cross following a corner. Corner, Sheffield Wednesday. Conceded by Jamaal Lascelles. Attempt blocked. Jacques Maghoma (Sheffield Wednesday) left footed shot from the centre of the box is blocked. Offside, Nottingham Forest. David Vaughan tries a through ball, but Michail Antonio is caught offside. Attempt saved. Michail Antonio (Nottingham Forest) header from the centre of the box is saved in the bottom left corner. Assisted by Eric Lichaj.